Under 2? Rear-facing for you! It is something that parents do on an almost daily basis, and you probably don’t think twice about it. Putting your kiddos into their car seat when you head out on the road. But did you know that studies estimate that 75% of car seats are installed or used incorrectly?!! Car crashes are the leading cause of death in children 1 to 13 years of age. Since this week is National Child Passenger Safety Week, over the next few posts, I hope to answer some of the most important questions parents may have about car seats. Today, we will focus on perhaps the biggest “error” I see parents making…turning their child forward facing too soon. For the past 6 years, the American Academy of Pediatrics along with every car safety organization have recommended that ALL children remain rear-facing until AT LEAST 2 years of age. In fact, children can remain rear-facing until they reach the height and weight limit for the specific car seat in the rear-facing position. For many rear-facing convertible car seats, the weight limit will be between 35-40 pounds (some even up to 45 pounds), and the height limit is the same for all car seats- the top of the child’s head should be 1 inch below the top of the car seat. Most state laws are lagging when it comes to catching up to this most recent car seat recommendation. 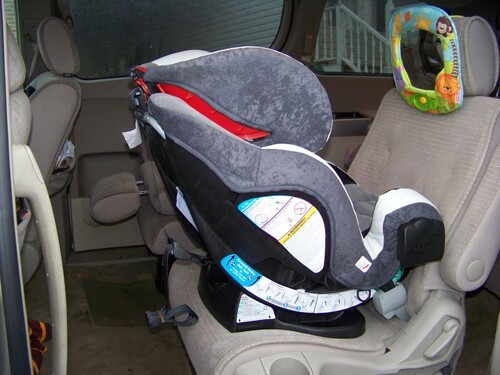 Only 8 states- California, Connecticut, New Jersey, Oklahoma, Oregon, Pennsylvania, Rhode Island, and South Carolina- have laws that require children to remain rear-facing until 2 years of age. So what is the big deal about rear-facing until 2 years of age? The answer to that question is it’s all about the head, neck and spine. If you have an infant or toddler at home, take a minute to look at their head in proportion to their body. In infants, the head accounts for upwards of 25% of their body weight! Compare that to adults where our head is only about 6% of our body weight. In a front-end collision, can you imagine putting 25% of your body weight as a rapid forward, force onto your delicate spine? Well, that is exactly what happens if an infant is forward facing in a crash. Another scientific fact…an infant or toddler’s spinal canal is made of bone and cartilage, which is the flexible stuff that we have on our ears and in our nose. This cartilage allows for more “stretch” of the spinal canal (which is why newborns and young children can contort themselves into all kinds of crazy positions and still seem to be happy as a clam). As children grow, this cartilage converts into hardened bone, but this “conversion” is not fully completed until late childhood. While extra stretch might be good for posing newborns for those cute pictures, in a head on collision, the spinal canal might be able to stretch up to 2 inches, but the spinal cord is not as flexible, and in severe cases, sudden shearing forces can cause internal severing of the spinal cord which can cause paralysis or even death. Now consider what happens during a head on collision when a child is in a rear-facing car seat. The infant or child will move towards the front of the car, which means the force of impact is absorbed over the entire head and back that is cradled by the car seat. There is no “whiplash” effect of the head violently going forward which reduces the risk of extreme stretching of the spinal canal. Ok, so now let me dispel some of the arguments I hear or read from parents in regards to rear-facing until 2 years of age. What if their legs are bent/feet touching the seat/legs hanging over the side of the seat? Good news…the risk of leg injury in collision is very minimal especially when you compare it to the risk of a head or neck injury for a young child who is forward facing in a collision. Not to mention, I will take a leg injury in a child over paralysis from a neck injury. My child gets bored or lonely when they are rear-facing. Well, more good news…your child knows your voice by 9-12 months of age, so simply by talking to them or singing with them, they will know you are there. As kids get older, playing “I Spy” is a great way to engage with children while driving. There are also some great mirrors you can buy and mount on the headrest of the rear seat that allow you and your child to see each other through your rearview mirror. In other countries such as Sweden, children remain rear-facing until at least 4 years of age, and you know what? The rate of children dying in car crashes is almost ZERO! Truly, it makes national headlines when a child dies in car crash anywhere in Sweden. Here in the US, there were 663 children 13 and under that died in car crashes in 2015 alone…that is more than a dozen children each and every week. As I stated before, the majority of state laws are lagging behind the times when it comes to car seat safety. We all know that getting laws changed takes time (let’s face it…a really long time), so let’s start a grassroots campaign to get the word out to all parents, grandparents, or anyone who transports young children about the importance of rear-facing seats in children under 2 years of age. Stay tuned for the next installment of the car seat safety files where I will discuss the various types of car seats available and for what age all of these seats are recommended.